Navan Fort in County Armagh, Northern Ireland. 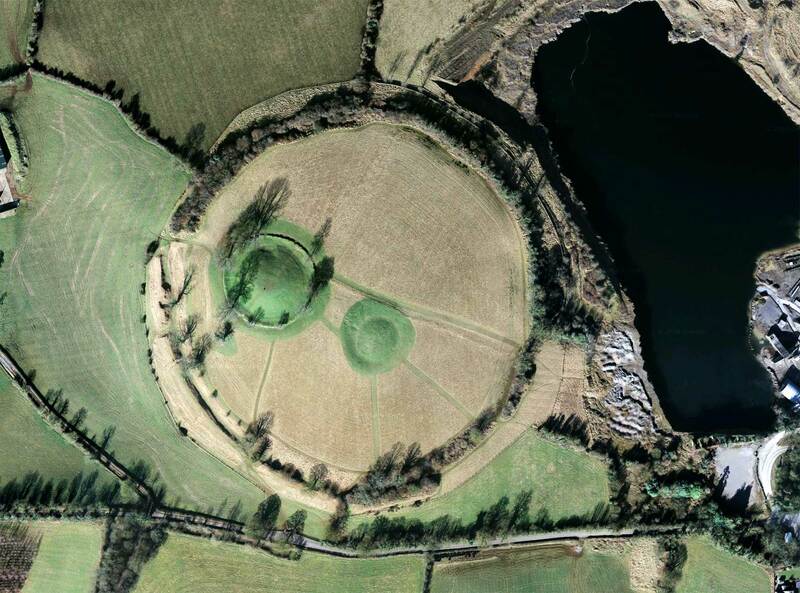 Navan Fort is a large circular earthwork enclosure 2 miles W. of Armagh city. It stands on a hill of glacial clay over limestone, and though from a distance this hill is not very prominent, from the top the view on a clear day is impressive. To the NW. are the Sperrins; Slieve Gallion is to the N. and Slemish to NE., while to the S. are the uplands of mid Armagh. Clearly visible to the E. is Armagh city with its two hilltop cathedrals. Only to the W. is the view less extensive. The small lake called Loughnashade is close to the NE. of the fort, and the road which runs S. of the earthwork was probably already old when it was shown on a map made in 1602. Click and drag to rotate. Select numbers for more info. Navan can be firmly identified with Emain Macha, ancient capital of the kings of Ulster. In legend Macha was a princess or goddess, and one explanation for the name Emain Macha (twins of Macha) was that she gave birth to twins after winning a race against the king’s fastest chariot. Another story was that she traced the outline of the earthwork with the pin of her brooch. The important body of Early Irish legend known as the Ulster Cycle centres round King Conchobor, who ruled his kingdom from Emain Macha. Here were great halls for feasting, for weapons and for the spoils of war, and here was the king’s warrior troop, the Red Branch Knights. To Emain the young Cú Chulainn came from his home in Co. Meath to be fostered and trained with the king’s 150-strong boy-troop. It is likely that these legends originated in the Iron Age, but they were first written down in the Early Christian period and survive in manuscripts of the 12th century and later. In recent times they have inspired writers and artists including Yeats, Synge, Lady Gregory and Louis le Broquy. Navan probably enters history in the map of Ireland by Ptolemy, a Greek geographer, in the second century AD, though the identification is not entirely certain. It is also not clear when Navan was abandoned as the Ulster capital. The traditional date is 331 AD, but another possibility is the 5th century, and it seems certain that the establishment of a very early church in Armagh was connected in some way with the old Ulster capital. Emain remained a well-known place – a landmark and a symbol. In about 800 it was contrasted, as a deserted pagan place, with the populous Christian centres. There was a battle at Emain in 759; Brian Boru camped there in 1005, and in 1387 Niall O’Neill built a house there to entertain ‘the learned companies of Ireland’. A pictorial map drawn in 1602 shows the Navan earthworks in the distance, with Loughnashade and the old road passing close by. The enclosure, known locally as Navan Ring or Navan Rath, is almost perfectly circular, embracing about 12 acres, defined by a massive bank with a ditch inside the bank. These are well preserved only to W. and S., but if they originally continued on this scale all round the circle the ditch would have covered about 15.5 acres. In a defensive site the ditch is usually outside the bank, so even before excavation it was clear that Navan was not an ordinary hillfort. 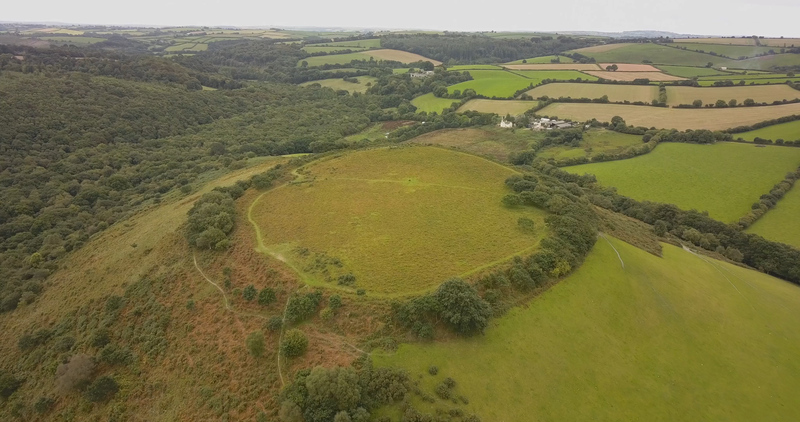 Within the circle is a low circular mound, with a surrounding infilled ditch, and at the highest point of the hill is a high mound, in its present form reconstructed after excavation. What the visitor cannot see on the grassy hill is the fascinating story so skilfully uncovered during 10 years of excavation, between 1961 and 1971, by the late Dudley Waterman, and here we can only give a brief outline. From the Neolithic period, the time of the first farmers in Ireland (3000-2000 BC), came pottery, flints and ploughmarks. In the Late Bronze Age, in about 700 BC, a circular ditched and fenced enclosure was built in the area now covered by the high mound. Inside was a round wooden house with a door to the E., with an attached larger ‘yard’, approached by a fenced ‘droveway’ from the E. These structures were replaced many times over the next 600 years – the houses nine times and the yards six times – a remarkable demonstration of continuity. Finds were not plentiful but were consistent with royal or aristocratic occupation. The most unusual was the skull of a barbary ape, which must have been brought from Spain or North Africa, perhaps as a gift. This sequence spans the transition from the Bronze to the Iron Age. In about 100 BC the area was cleared and transformed by the building of a huge wooden structure, 40 metres in diameter. It had an outer wall of timber and inside were five concentric rings of large posts, 275 in all, with the stump of a particularly big post in a pit at the centre. This post made possible the very close dating, to 100 BC, by dendrochronology (tree ring dating). It is likely that the structure was roofed, but there was no sign that it had been used for any length of time. Instead it had been filled with limestone boulders and set on fire. The remains were then covered with sods and clay to form a high mound. We do not know what this great wooden structure was, but it may have been a temple, and perhaps both its building and its burning were ritual acts. But, whatever its purpose, it is certainly one of the most remarkable buildings yet found in the whole Celtic world – the world of Iron Age Europe. A small excavation done in 1961 on the low mound to the E. showed that the Bronze Age structures were present here also, but there was no clear evidence for the date of the mound. It may be a barrow – a burial mound – of the Iron Age. No excavation has yet been done on the surrounding earthworks, so the age of the ‘ring’ is unknown, and most of the area inside is also unexcavated. In addition to the excavated material, may objects have been found by chance in and around Navan over the past 200 years. They range in date from the Bronze Age to the Early Christian period, but the most important are from the Iron Age, including the large decorated trumpet or horn, one of four found near Loughnashade in the 18th century (now in the National Museum in Dublin), and several brooches, including a kind called the ‘Navan type’ after this site (see illustrations). Dorsey enclosure has been shown by excavation to date to the same period as Navan (100 BC), and so has the Black Pig’s Dyke in Co. Monaghan. The linear earthworks known as the Dane’s Casts, in W. Down and mid and S. Armagh, have not been dated but may also survive from the Iron Age and may have marked frontiers or tribal boundaries. Other royal capitals in Ireland are Tara in Meath, Cruachain in Connacht and Dún Áilinne in Leinster. A comparable site in England would be King Arthur’s Camelot, base for the Knights of the Round Table, but that site has never been firmly identified, whilst knowledge of the ancient Irish capitals has never been lost. Limestone has been quarried from the Navan area for more than 150 years; indeed the stone for some of Armagh’s fine buildings came from here. But extraction was on a fairly small scale until recently, and the quarry only approached its present size in the early 1970s. An application to extend the quarry still further led to a Public Inquiry in 1985, at which very widespread opposition to the quarry extension was expressed, and in May 1986 the Minister for the Environment, Mr Richard Needham, announced that the Department of the Environment had decided to refuse the application. The side of the site towards the quarry has been securely fenced and walled and visitors must remain within the fence. Further Reading Current Archaeology 22 (1970), 307-8; C. J. Lynn on King’s Stables excavation in Ulster J. Archaeol. 40 (1977), 42-62; and on Navan in Emania 1 (1986), 11-19; J. P. Mallory, Navan Fort (booklet, 1987). Access 2 miles W. of Armagh, reached by a minor road (signposted) N. from the A3 road to Killylea.